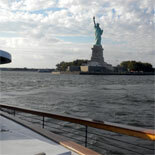 Step aboard the teak decks of the Manhattan, an elegant 1920s-style yacht, for an educational around-Manhattan architecture tour, hosted by architects and members of the American Institute of Architects New York Chapter (AIANY), on the Around Manhattan Architecture Tour. 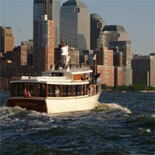 Step aboard the teak decks of the Manhattan, our elegant, 1920s-style yacht, for an educational around-Manhattan architecture tour, hosted by architects and members of the American Institute of Architects New York Chapter (AIANY). 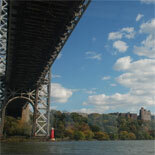 Experience a comfortable and unique trip through the Hudson, East and Harlem rivers from the climate-controlled and enclosed back-deck observatory or wander to the outer decks for fresh air and sunlight with a complimentary beverage in hand. Guests are treated to a complimentary beer, wine or champagne from the bar & light snacks as well as soda, water, tea and coffee. On this 2.75-hour cruise, you will completely circumnavigate the island of Manhattan (passing under all 18 bridges) while taking in the sites and architecture tour designed by the AIANY. An examination of the visionary development of NYC's 6th borough: the waterfront! Memorials: an update on One World Trade Center, and an exploration of Manhattan's waterside memorials. Don't miss this opportunity to learn about New York's Architecture. 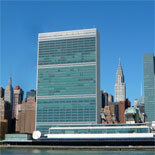 Get your eTickets today for the Around Manhattan Architecture Tour! Departs select days-check calendar. Sailing time at 1:30pm in Jan & Feb. Mar Sailing time: 1:45pm and additional sailing times on Sat. & Sun staring in May at 10:15am. 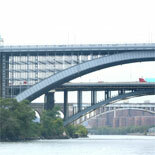 There is parking available at Chelsea Piers but unfortunately, they do not issue vouchers for parking at Chelsea Piers. Please be aware that parking may be limited at times due to special events or construction that is going on at the piers. Once purchased and scheduled, tickets cannot be refunded. Activity takes place rain or shine. In the rare situation where the seller is forced to cancel, ticket-holders will be allowed to reschedule to another time (subject to availability), receive credit for a future event, or receive a refund. Gratuity is not included in the price of your cruise. Parties of 12 or more need to contact Groups Sales at 305-304-7451 to confirm space. Guarantee of a full circumnavigation of Manhattan is not included. On rare occasions, the Spuyten Duyvil train bridge is inoperable and cannot open for us to pass through. This is often times not known until the tour is underway. There are no refunds for tours that cannot fully circumnavigate. They will accommodate such cases with a tour that features a double backing of the route and further detail of the waterfront sites.